The Arctic wilderness is far from untouched. For example, concentrations of environmentally hazardous PCBs in polar bears in Svalbard have been found to be up to six times higher than in polar bears in Canada. Because of the difficult climate and other natural conditions and the large areas involved, monitoring the environment in the Arctic is a major undertaking. The Arctic environment is under growing pressure from human activity. Tourists are heading deeper into the wilderness, and more and more people wish to experience the untouched nature that can only be found in polar regions. Commercial and industrial activities are also expanding further into the Arctic, and new technology is giving access to areas and resources that were once out of reach. Because the Arctic environment is so vulnerable, it is increasingly important to investigate the Arctic ecosystems and the impacts of these developments. In recent years, the Norwegian environmental authorities have given higher priority to management of the natural environment in Norway’s territories in the Arctic. This means Svalbard (Spitsbergen and the rest of the archipelago), Jan Mayen, Bjørnøya (Bear Island) and the surrounding territorial waters. Norway has set ambitious goals for its management of the Arctic environment, one of which is for Svalbard to become one of the best managed wilderness areas in the world. Polar bears (Ursus maritimus) are found throughout the Arctic, including the Svalbard archipelago and the surrounding sea ice. The species is the world’s largest terrestrial carnivore. Polar bears hunt mainly from the sea ice, and have difficulty finding enough food when there is no ice cover. Climate change and pollution are the most serious threats to polar bears. There are about 20 000–25 000 polar bears in the world, unevenly distributed across the Arctic. Satellite tracking shows that there is a joint Norwegian-Russian subpopulation around Svalbard and the Barents Sea. In 2004, it was estimated that there were almost 3000 polar bears in this region. In August 2015, a survey of the Norwegian subpopulation estimated almost 1000 polar bears. Of these a little less than 300 were located in Svalbard – most of them close to the ice edge. The estimate is higher than in 2004, but the uncertainty of the data is high. The survey indicates that polar bears have managed relatively well through a period of decreasing access to sea ice for much of the year. In addition, polar bear dens have been studied on the island of Hopen (southeast of Spitsbergen) and certain other areas of Svalbard. The number of dens on Hopen appears to fluctuate depending on the timing of ice formation in autumn. There are fewer dens in years when the ice cover forms late in the season than in years when it forms early. Because of this link with climate change and its impacts, there is now a permanent monitoring programme for polar bear dens in Svalbard. There are eight species of bears across the world, but only the polar bear is entirely carnivorous, feeding mainly on seals. Hunting behaviour and the area used as a home range vary widely. Some polar bears roam across an area as large as mainland Norway. On the other hand, tagging of female polar bears from Storfjorden between the islands of Spitsbergen and Edgeøya has shown that they remain in this area and do not roam across the Barents Sea. Environmental conditions in the Arctic are highly variable, which results in a wide range of variation in many of the biological systems in the region as well. This makes it difficult to distinguish between natural variation and variation caused by human activity. Many climate models predict a dramatic loss of sea ice during the present century. In the last few years, observations have shown a clear reduction in ice cover in almost all parts of the Arctic. Climate models indicate that it will only be a few decades before the entire Arctic Basin is ice-free in summer. In 2007, researchers from the US Geological Survey modelled sea ice and the likely response of the polar bear population to a dramatic reduction in ice cover. Their studies showed that we could lose two-thirds of the world population of polar bears by 2050. Time will show whether this happens, but there is general agreement that ice cover will continue to decline. Polar bears are highly dependent on ice cover, since they hunt mainly from the ice. Their most important prey species, the ringed seal and bearded seal, are perhaps even more strongly associated with the sea ice. The polar bear is at the top of the Arctic food chain, and will therefore be rapidly affected by changes in the populations of prey species. It has been documented that polar bears have high loads of persistent organic pollutants (POPs), and that these pollutants affect bear health. Concentrations of new types of pollutants, such as brominated flame retardants and fluorinated compounds, are rising in polar bears, whereas there is a general decline in levels of “old” POPs such as PCBs and DDT in the Arctic. The levels of pollutants measured in polar bears on Svalbard are so high that they have been linked to several health defects, such as reduced immune response and disturbed hormone balance. However, we are not yet able to say how seriously pollutants will affect the polar bear's ability to reproduce and what impact this will have on the population itself. Climate change is perhaps the greatest threat to the survival of the polar bear. Global warming is resulting in loss of ice cover, and ice is forming later in autumn and melting earlier in spring. This shortens the bears' hunting season and results in a loss of habitat for both bears and their prey species. In addition, migration patterns and access to denning areas are affected. Snow quality also changes, making it more difficult for polar bears to find snow of suitable for constructing dens. The main prey of polar bears is seals, and they eat large quantities of seal blubber. This is why polar bears are so vulnerable to fat-soluble pollutants, which accumulate in fatty tissue. PCB levels in polar bears are higher than those found in other Arctic species, and levels in polar bears from Svalbard are as high as those measured in bears from Canada and East Grenland, but lower than in Alaska. On the other hand, the levels of brominated flame retardants are higher in polar bears from Svalbard, East Greenland and Hudson Bay, than in polar bears in other areas. Levels of mercury are generally lower in polar bears from Svalbard than in polar bears in other areas. Climate change is expected to influence the transport, spread and uptake of POPs and mercury in polar bears. The polar bear is most vulnerable to the effects of pollutants during long ice-free periods when they live off their own fat reserves. This leads to the mobilization of fat-soluble pollutants, that are transported from fat to vital organs such as liver, blood and brain. The polar bear is protected throughout the Arctic, but Inuit communities in North America and Greenland are allowed to take a limited harvest. Hunting is strictly regulated, and quotas should only be set if enough is known about the subpopulation to document that the harvest is sustainable. Despite this, quotas are still being set for some areas where too little is known, for example Eastern Greenland and for some subpopulations i Canada. Polar bears are also occasionally killed illegally in northwestern Russia. No hunting is permitted in Svalbard, which means that Svalbard’s polar bears are the last remaining large polar bear population anywhere in the world that is not harvested. All the polar bear range states – Greenland (formerly Denmark), Canada, the US, Russia (formerly the Soviet Union) and Norway – are parties to the 1973 Agreement on the Conservation of Polar Bears. The agreement bans the hunting of polar bears, with the exception of a limited quota for indigenous peoples, and forbids sales of skins and other polar bear products. It also requires the parties to conduct research and monitoring as a basis for managing polar bear populations. In 2006, the International Union for Conservation of Nature (IUCN) changed the status of the polar bear on the IUCN Red List to “vulnerable” on the basis of evidence suggesting that a population reduction of more than 30% is likely within three generations (45 years). Since then, several countries have adjusted their polar bear management regimes. The species was already strictly protected in Norway. In response to the strong international interest in polar bears, the parties to the Polar Bear Agreement have agreed to hold more regular meetings. There had been no meeting since 1981, but at an informal meeting in 2007 they agreed to organise a Meeting of the Parties every other year. The first of these was held in Tromsø in Northern Norway in 2009, and there have been meetings in Canada in 2011, Russia in 2013 and Greenland in 2015. The last meeting was held in Alaska in 2018. The Norwegian-Russian polar bear subpopulation in the Barents Sea is continuously monitored, and there are ongoing research programmes. Calculations of the size of the population are based on counts from aircrafts. The polar bears are also monitored by mark-recapture studies. One method used to find out more about how widely polar bears range and how they use their habitat is to fit them with satellite radio collars. Blood, fatty tissue, hair samples are taken at the same time, and a small tooth for age determination. The samples are used for different studies including; genetics, health and studies on their diet. In addition, we also obtain information about developments in, for example, the number of cubs born and cub survival. In addition, ice conditions around Svalbard are monitored to provide information on how much the polar bear habitat and hunting conditions are altering as the climate changes. Six different seal species are found around Svalbard and Jan Mayen – harp seal, hooded seal, common seal, ringed seal, bearded seal and walrus. Climate change is creating problems for several of them, because the sea temperature is rising with global warming and reducing sea and fjord ice cover in the Arctic. In January 2013 and 2014 there was little sea ice around Svalbard. There was also limited ice cover and not much snow on the ice in a number of the fjords along the west coast of Spitsbergen these years. One of these fjords is Kongsfjorden, which has received a great deal of research attention in recent years. Measurements show that since 2006, higher water temperatures here have been preventing the formation of fjord ice. Ringed seals give birth to their pups in snow lairs on the fjord ice, and can only dig proper lairs if the ice is thick enough and there is sufficient snow cover. Pups on the ice surface are easy prey for polar bears, Arctic foxes and seabirds and are unlikely to survive the critical early weeks of life. Ringed seals often return to their own birthplace to give birth. Changes in ice and snow conditions may therefore be a serious threat to the species. Declining sea ice cover also causes problems for hooded seals during the whelping season at the end of March. Hooded seals are gregarious, and females congregate for the brief whelping season. They are dependent on large expanses of ice. The pups too face problems if the ice floes are too small, since they cannot leave the ice for the first few weeks after birth. Polar bears have been observed in the whelping areas in recent years, and predation may be another factor behind lower pup survival rates. The harp seal population is the most abundant seal species in the region. One stock whelps near Jan Mayen (the West Ice) and the other in Russia, in the White Sea (the East Ice). In 2012, it was estimated that there were about 631 000 adult seals in the West Ice and about 1.3 million in the East Ice. There were performed counts of the White sea population in 2013, but the results are not yet analyzed and published. A large harvest was taken from the East Ice stock in the years after the Second World War, but strict regulation by quotas was introduced from 1965. Seal numbers rose rapidly after this, and catches of pups and adults were later increased again. However, numbers have declined considerably once more since 2000, and the catches have also been greatly reduced. Lower seal numbers are explained by a reduction in the area of drift ice and in ice thickness in the White Sea since 2000. All hooded seals in the Northeast Atlantic are considered to belong to the same stock, which whelps in the West Ice. On the basis of aerial surveys, it was estimated that there were about 82 000 individuals in 2013. This corresponds to a decline of 80–90 per cent since the 1950s, and Norway therefore gave the stock protected status in 2007. It was also classified as endangered in the 2010 Norwegian Red List. Projections of a continued decline in sea ice extent make the future of the species uncertain. Harp seals are still harvested in the West Ice, but in much smaller numbers than before. Norway discontinued hooded seal catches after the 2006 season because of uncertainty about the stock trend. Norway also permits catches of both ringed seals and bearded seals. Only small numbers are taken, and the Governor of Svalbard keeps hunting statistics for these species. Less is known about their population status, but there are indications that recruitment to the ringed seal population has been poor in the Svalbard area in recent years because of ice conditions. Seals are carnivores, and are top predators in food chains. They are therefore vulnerable to accumulation of pollutants such as persistent organic pollutants (POPs) that contaminate their food. Levels of certain substances in Arctic seals have declined in recent decades, partly because of strict rules under the Stockholm Convention, which regulates the production and use of POPs. The International Council for the Exploration of the Sea (ICES) publishes recommendations on catches of harp seals every five years. The stock is assessed at regular intervals on the basis of catch data, registration of pups and capture-mark-recapture surveys. The current harvest levels for harp seal, ringed seal and bearded seal appear to be within safe biological limits. The common seal and walrus are protected species in Svalbard. Despite the high Arctic latitude the west coast of Spitsbergen enjoys a mild climate. The sea is usually ice-free from June to December. Northern and eastern parts of Svalbard are colder than the west. The maximum temperature recorded in Svalbard is 21.3 °C and the minimum -49.2 °C. Strong winds prevail during the winter six months whilst fog is a common summer condition. There is little precipitation. Longyearbyen sees the midnight sun between 20th April and 23rd August, but is dark between 26th October and 15th February. The Governor has represented Norwegian sovereignty since this was established on 14th August 1925. It is the Governor's task to assert Norway's rights and obligations under the Svalbard Treaty, and to ensure that all citizens of the signatory nations are given equal rights within the Treaty area. The Governor also acts as chief of police and environmental authority for the whole of Svalbard. In addition, the governor's office also has a wide range of administrative duties in fields such as population registry, civil matters, child welfare, rescue services, pollution control and oil spill containment, nature conservation, cultural heritage management, and wildlife and freshwater fish management. Ropeway for transporting coal in Longyearbyen, Svalbard. Photo: Norwegian Polar Institute. Glaciers cover 60 per cent of Svalbard's land area, and much of the remaining area is mountainous. The terrain is often steep and includes large areas of scree and moraine. Less than 10 per cent of the area is covered by vegetation. However, the climate is relatively favourable for plant growth. Low-lying valleys, plains and coastal areas are generally covered by vegetation to some extent. The plants are small and seldom more than 20 cm tall. There are no upright trees or bushes, and the only woody plants are low or creeping dwarf shrubs. Considering that Svalbard lies so far north, there is a surprising amount of plant cover. However, the species diversity is not particularly high, probably because of the isolated position of the islands. Botanists have registered 173 species of vascular plants, 373 mosses, 597 lichens and 705 fungi, and in addition 1122 species of cyanobacteria and algae, including marine and fresh-water species. The terrestrial vegetation provides food supplies for about 10 000 reindeer and large numbers of geese in the summer. Of the 173 species of vascular plants, 9 are classified as endangered and 16 as vulnerable in Svalbard. Most of the endangered species and many of the vulnerable species are found more commonly in mainland Norway. Five of the 9 endangered species are found in a locality in the Northwest Spitsbergen National Park where there are hot springs. Wear and tear from people and vehicles, infrastructure development and tourism all affect the vegetation in Svalbard. Even though only a small proportion of Svalbard is affected by these activities, this includes a large part of the areas with a continuous and relatively species-rich vegetation cover. Acid rain also has a negative effect on some species. The area between Longyearbyen and Barentsburg is most seriously affected by infrastructure development and tracks made by offroad vehicles. There are also obvious tracks in the valleys Gipsdalen, Reindalen and the lower part of Sassendalen. These areas have some of the highest species diversity in Svalbard. Vehicle tracks remain visible on the tundra for a very long time, and the damage may even become worse over time once the plant cover is worn away. Most vehicle tracks result from mining activities and oil exploration before 1990. The Russian mining company has shown interest in resuming its activities in Grumantbyen and Colesbukta, and has applied for permission to construct a road from Barentsburg to Colesbukta. Colesbukta is a botanically vulnerable area with several rare plant species that require relatively warm conditions, such as cloudberry (Rubus chamaemorus) and an Arctic species of harebell (Campanula gieseckiana). Short stretches of road have been constructed and others are under consideration in connection with Norwegian mining activities. Plants in general, and particularly the species that grow near the hot springs in Northwest Spitsbergen National Park, are under pressure from tourist traffic. This applies to cruise ships in particular, since they usually land large numbers of people in one place. Concentrated wear and tear in a small area can cause damage to the vegetation and soil that may take years to recover, because plants grow so slowly and soil formation is also very slow. Snowmobile traffic can also damage the soil and vegetation. Climate change is expected to bring milder winters, wetter summers and more unstable weather conditions. This will have a particularly serious effect in polar regions, where temperatures are normally low and stable and there is little precipitation. Plants adapted to a cold climate and dry summers will be negatively affected. Climate change will result in changes in species composition, which in turn will affect grazing animals such as reindeer and geese. Emissions from Europe and Russia add to the deposition of acid rain in Svalbard. Nitrogen and sulphur are stored in the snow and may be released in high concentrations during the thaws. Woody plants and dwarf shrubs are affected because the mycorrhiza (the symbiotic relationship between specific fungi and the plants' root systems) is damaged by acidity, and nutrient uptake therefore suffers. Lichens and mosses are also very sensitive to nitrogen deposition. Large areas of Svalbard are protected as national parks and nature reserves. In addition, large plant protection reserves were established in central Spitsbergen and at the head of Kongsfjorden in 1932. However, the plant protection reserves are not considered to be a very effective means of nature conservation. The most species-rich and productive habitats in Svalbard are also poorly represented in the existing protected areas. Increased motorised traffic and new developments outside the existing settlements and mines may also add to the pressure on vulnerable vegetation unless nature conservation measures are strengthened. A new plan for area protection is intended to amend this situaton. No other high Arctic locations in the world have as many visitors as Svalbard does. This is mainly due to good air links and easy sea access for much of the year. A special feature of the islands is the absence of a road network. There are simply no roads except for short stretches in and near the settlements. All travel outside settlements must be offroad, by sea, or by air. Since the terrain in Svalbard is so vulnerable, organising travel to avoid damaging the environment is a real challenge. Off-road travel in Svalbard is connected mainly with tourism, recreation, research, and administration. Snowmobiles and boats are the key means of transport. Large and small cruise ships ply the coast during the summer season, mainly between Longyearbyen and northward along the west coast of Spitsbergen. Snow mobiling occurs mostly between February and May and focuses on the settlements and certain popular destinations on Nordenskiöld Land. Helicopters, aircraft and launches are also used for government and commercial purposes. Motorised traffic in Svalbard can have direct negative impacts as a result of noise and other disturbances to animal life. It also causes damage to vegetation, tundra, and cultural remains. It is relatively uncertain just how serious this impact is. The most common impacts of traffic on Arctic tundra are changes in species composition and the distribution of vegetation, compaction of the soil, changes in pathways for water and nutrients, changes in mechanical structure, and changes in temperature and thus the ice/water threshold. The damage may vary from shallow tracks to deep gullies with accelerating erosion. In the central parts of Nordenskiöld Land we find several examples which were mainly caused by the use of heavy vehicles for coal mining before 1990. Studies in the USA and northern Sweden have shown that snowmobiles driven on snow-covered ground have no detectable effect on ground vegetation. However, during a thaw significant damage can arise from snowmobiles churning up the vegetation, potentially damaging early spring plants. Snowmobile tracks are not considered a major problem as yet, but we must keep a watchful eye on developments in the central areas where traffic is heaviest. Some animals are disturbed by motorised traffic, and - as a result of direct disturbance, stress, or hunting - the animals' condition may deteriorate, or they may choose to avoid otherwise attractive habitats. Again, this has not been identified as a major problem in Svalbard. Many people find that noise and vehicle tracks spoil their enjoyment of the pristine environment they came to see. On the other hand, snowmobiles have a long history in Svalbard in connection with recreation activities. It is now difficult to enjoy traditional outdoor recreational activities around the settlements without disturbance, for much of the year. Cruise ships and aircraft can also disturb the peace and quiet for adventurers wishing to explore the wilderness of Svalbard. Wilderness and quiet are key factors for marketing Svalbard as a travel destination, and the lack of areas that are closed to motor vehicles may reduce the islands' appeal. Recent years have seen a growing interest in Svalbard as a tourist destination. One reason is the Norwegian government's decision to develop tourism in response to the decline in coal mining. There is also a general worldwide interest in "extreme tourism" where Svalbard has much to offer. Scientific research is another key reason to visit the islands, so the authorities provide special facilities to accomodate these activities. Limited environmental impact has been recorded as a result of cruise traffic around Svalbard. There has been some damage to vegetation and to cultural remains in the most frequently visited areas of Northwest Spitsbergen. Cultural remains are non-renewable resources and can be partly or completely destroyed by visitors. The potential danger of shipwreck and oil pollution from boat traffic is another important threat to the environment. Drift ice and unreliable navigation charts contribute to increasing the risk of accidents, which is considerably higher here than compared to the Norwegian mainland coast. In order to safeguard the environment and cultural heritage tourism and other travel activities are regulated by law.This has also been done for safety reasons. The regulations require non-residents to register with the Governor of Svalbard before they leave the local area around Longyearbyen, Administrative Region 10. The Governor may demand amendments to tour plans in the national parks and nature reserves if there is risk of damage to the natural environment or cultural heritage. The physical environment in Svalbard is constantly monitored. The environmental monitoring programme for Svalbard and Jan Mayen (MOSJ) will bring together data from a variety of sources, so that the results can be seen in context and compared. The system is being developed now, and will be a useful tool in the management of Svalbard. It is also hoped that the system will help us to identify areas where future research is required. There are about 20 000–25 000 polar bears in the world, unevenly distributed throughout the Arctic. Satellite tracking shows that there is a joint Norwegian-Russian subpopulation around Svalbard and the Barents Sea. In 2004, it was estimated that there were almost 3000 polar bears in this region. A new survey of the joint Rusian-Norwegian population is planned to take place during August 2015. Polar bear dens have been studied on the island of Hopen (southeast of Spitsbergen) and certain other areas of Svalbard. The number of dens on Hopen appears to fluctuate depending on the timing of ice formation in autumn. There are fewer dens in years when the ice cover forms late in the season than in years when it forms early. Because of this link with climate change and its impacts, there is now a permanent monitoring programme for polar bear dens in Svalbard. In 2007, researchers from the US Geological Survey modelled sea ice and the likely response of the polar bear population to a dramatic reduction in ice cover. Their studies showed that we could lose two-thirds of the world population of polar bears by 2050. Time will show whether this happens, but there is general agreement that ice cover will continue to decline. Polar bears are highly dependent on ice cover, since they hunt mainly from the ice. Their most important prey species, ringed seal and bearded seal, are perhaps even more strongly associated with the sea ice. The polar bear is at the top of the Arctic food chain, and will therefore rapidly be affected by changes in the populations of prey species. It has been documented that polar bears carry high loads of persistent organic pollutants (POPs), and that these pollutants affect bear health. Concentrations of new types of pollutants, such as brominated flame retardants and fluorinated compounds, are rising in polar bears, whereas there is a general decline in levels of “old” POPs such as PCBs and DDT in the Arctic. These effects could in turn reduce survival or cause rapid population decline because of disease. However, we do not yet know enough about how POPs are actually affecting polar bear reproduction or population size. Climate change is perhaps the greatest threat to the survival of the polar bear. Global warming is resulting in loss of ice cover, and ice is forming later in autumn and melting earlier in spring. This shortens the bears' hunting season and results in a loss of habitat for both bears and their prey species. In addition, migration patterns and access to denning areas are affected. Snow quality also changes, making it more difficult for polar bears to find snow of a suitable type for constructing dens. Polar bears’ main prey is seals, and they eat large quantities of seal blubber. This is why polar bears are so vulnerable to fat-soluble pollutants, which accumulate in fatty tissue. PCB levels in polar bears are higher than those found in other Arctic species, and levels in polar bears from Svalbard are higher than those measured in bears from Canada and Alaska. Recent sampling suggests that polar bears in the eastern Barents Sea and the Kara Sea are the most heavily polluted in the world, closely followed by polar bears from Svalbard. Climate change is expected to influence the transport, spread and uptake of POPs and mercury in polar bears. The polar bear is protected throughout the Arctic, but Inuit communities in North America and Greenland are allowed to take a limited harvest. Hunting is strictly regulated, and quotas should only be set if enough is known about the subpopulation to document that the harvest is sustainable. Despite this, quotas are still being set for some areas where too little is known, for example eastern Greenland. No hunting is permitted in Svalbard. Polar bears are occasionally killed illegally in northwestern Russia, which may mean that Svalbard’s polar bears are the last remaining large carnivore population anywhere in the world that is not harvested. All the polar bear range states (Greenland (formerly Denmark), Canada, the US, Russia (formerly the Soviet Union) and Norway) are parties to the 1973 Agreement on the Conservation of Polar Bears. The agreement bans the hunting, killing and capturing of polar bears, with the exception of a limited quota for indigenous peoples, and forbids sales of skins and other polar bear products. It also requires the parties to conduct research and monitoring as a basis for managing polar bear populations. In 2006, the International Union for Conservation of Nature (IUCN) changed the status of the polar bear on the IUCN Red List to “vulnerable” on the basis of evidence suggesting that a population reduction of more than 30 % is likely within three generations (45 years). Since then, several countries have adjusted their polar bear management regimes. The species was already strictly protected in Norway. In response to the strong international interest in polar bears, the parties to the Polar Bear Agreement have agreed to hold more regular meetings. There had been no meeting since 1981, but at an informal meeting in 2007 they agreed to organise a Meeting of the Parties every other year. The first of these was held in Tromsø in Northern Norway in March 2009, and later at Iqaluit in Canada in October 2011 and in Russia in December 2013. The next meeting is going to be held in September/October 2015 at Ilulissat in Greenland. The Norwegian-Russian polar bear subpopulation in the Barents Sea is continuously monitored, and there are ongoing research programmes. The new Norwegian-Russian survey planned in 2015, will hopefully provide a better basis than we have now, for assessing whether the stock grows, is stable or declining. The polar bears are monitored by mark-recapture studies, and information is being obtained on the number of cubs born and cub survival. One method used to find out more about how widely polar bears range and how they use their habitat is to fit them with satellite radio collars. Between 1988 and 2012, 245 female polar bears were fitted with these devices. Blood and fatty tissue samples are taken at the same time. In addition, ice conditions around Svalbard are monitored to provide information on how much the polar bear habitat and hunting conditions are altering as the climate changes. The current monitoring programmes have given us early warning that pollutants are a significant stress factor for polar bears. However, without further surveys that provide a good enough statistical basis for determining whether the population size is changing, it is not possible to tell whether the number of polar bears in the Barents Sea areas is actually being affected. Global climate change is having a greater impact in the Arctic than in other parts of the world. Many species are dependent on the sea ice for their survival, and are experiencing dramatic changes in conditions as ice cover decreases. 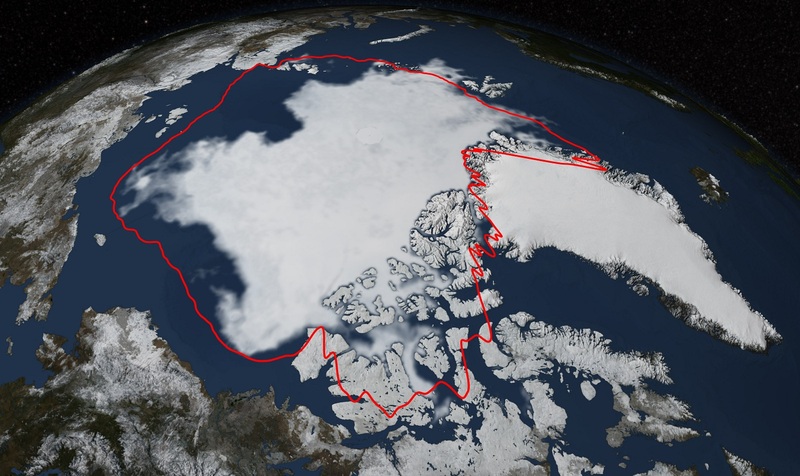 The extent of the sea ice in the Arctic reached a record low in 2012. The Earth’s climate is already changing, and the changes are particularly marked in the Arctic. But the impacts of climate change in the Arctic will be felt throughout the world, because changes in physical processes here influence the climate on a global scale. Processes of change in the Arctic can therefore provide a unique insight into the climate change that is already taking place and also act as a forewarning of the future regional and global impacts of these changes. The annual mean temperature has been rising about twice as fast in the Arctic as in the rest of the world in the past few decades, though with some variations within the region. In general, temperatures are rising faster in winter than in summer. In Alaska and western Canada, the average winter temperature has risen by 3–4°C in the past 50 years. Modelling using scenarios developed for the IPCC indicate that average temperature will continue to rise throughout the Arctic. One degree matters — Full movie from European Environment Agency on Vimeo. Since the early 1960s, most glaciers and ice sheets in the Arctic have retreated and their volume has shrunk. This trend became more marked in the 1990s. Several of the glaciers in Svalbard have shown a negative mass balance every year since 2000; in other words, there is an annual net loss of ice, and they are shrinking in size. As more glacier ice melts, a greater volume of water enters the oceans, raising the global sea level. Global models show that Arctic glaciers will make an increasing contribution to the rise in sea level over the next 100 years. The extent and thickness of the sea ice has been declining for several years, and there is now very little thick multi-year ice in the Arctic. The thinner, younger sea ice melts more readily. In 2012, a record level of ice melt was recorded in the Arctic. There has never been so little ice cover since satellite measurements started in 1979. Observations showed 700 000 km2 less sea ice than at the previous minimum in 2007. This satellite image from NASA (NASA/Goddard Scientific Visualization Studio) shows the extent of the sea ice on 12 September 2015. The yellow line shows the average minimum for the last 30 years. Sea ice cover varies widely from year to year, and this variability is expected to continue. However, the rate of decline is expected to accelerate, and climate models suggest that it may only be a few decades until the Arctic Ocean is ice-free in summer. The reduction in ice cover will affect the sea surface temperature. Snow-covered ice absorbs only 10–20 per cent of the incoming solar energy, whereas open water absorbs more than 90 per cent. The sun thus warms the sea water, and evaporation from the surface increases. This is an example of a positive feedback loop: greater absorption of solar energy results in accelerating ice melt, which in turn results in even more absorption of solar energy. Ocean circulation in the Arctic is controlled by the inflow of relatively warm Atlantic water with the Gulf Stream and the outflow of relatively cold, less saline water via the East Greenland current. Ice is mainly transported out of the Arctic Ocean with the East Greenland current. Scientists have known for a long time that the Greenland Sea is an important area for bottom water formation, which may be one of the main forces driving the Norwegian Atlantic current. Water continuously sinks towards the bottom, and has to be replaced by surface water, which flows in with the Atlantic current. Climate change may influence bottom water formation and ocean currents, with further repercussions on sea ice extent and the climate in Arctic parts of the Nordic region. Studies of sediment cores from the seabed show that during and just after the last Ice Age, there were large, abrupt changes in temperature in the Arctic. It is estimated that the temperature changed by 5–7°C over a period of only 10 to 100 years. It is possible that this happened because the formation of bottom water ceased, perhaps during periods of rapid ice melt. It is uncertain whether we can expect the current rate of global warming to have such consequences, but recent research indicates that bottom water formation is unlikely to cease in the next 100–200 years. Observations sugget that precipitation has risen by about 8 per cent in the Arctic as a whole over the past 100 years. However, this result is somewhat uncertain, both because of sources of error in the measurement of precipitation in a cold Arctic climate and because there is a lack of data from parts of the region. In the Arctic as a whole, annual precipitation is expected to rise by about 20 per cent during the 21st century, most of this in the form of rain. The greatest rise is expected in coastal areas in autumn and winter. In these areas, an increase of more than 30 per cent is expected. Climate change in the Arctic will have impacts on human society as well as on animal and plant life. The treeline is expected to shift northwards and upwards, and much of the tundra will become forest. Tundra vegetation will gradually shift into areas that are now polar desert. Vegetation will probably become more productive and carbon uptake will therefore increase. However, as snow and ice melts the Earth’s surface will become less reflective. This effect will probably outweigh the extra carbon uptake, resulting in greater global warming. Outbreaks of insect pests and forest fires are likely to be more frequent, more serious and more prolonged. This will make it easier for alien species to spread to Norway. Shrinking sea ice cover will drastically reduce the area of suitable habitat for polar bears, ice-dependent seals and some seabirds. Some species will be at risk of extinction. Climate change will alter the availability of food supplies and suitability of breeding areas and migration routes for reindeer and other terrestrial species. The distribution of many terrestrial and marine species is expected to shift northwards. New species will become established in the Arctic, which will affect species already present in the region. As the climate changes, so do short-term weather patterns. Extreme weather events are likely to be more frequent, and new areas may become vulnerable to flooding, landslides and avalanches. The ice edge and parts of the polar front will retreat northwards, and the area where polar lows are liable to form will also move further north. There will be a lower risk of polar lows forming the coast of North Norway. Where the soil is suitable, a longer and warmer growing season will make agriculture possible further north. However, winter temperatures close to 0°C will be more frequent, which will increase the risk of winter damage to crops. Health risks are likely to increase because new species that spread to Norway may well be vectors for animal diseases that also affect people, such as West Nile fever. Certain fisheries in Arctic seas are of global importance and make a substantial contribution to the regional economy. Some of them will probably become more productive. Most global climate models predict more warming in the polar regions than in the rest of the world. A good deal of research is currently being done on what impacts this may have on the global climate system. Long-term environmental monitoring is an important basis for a better understanding of the climate. Data should be collected on changes in sea ice cover, ocean circulation, heat balance and glacier mass balance. We also need to learn more about energy exchange process and ocean-atmosphere-sea ice interactions. The results of the Arctic Climate Impact Assessment (ACIA) were published in 2004. This was the first comprehensive assessment and analysis of climate change in the Arctic and its consequences for the region and for the world as a whole. The Norwegian authorities initiated a follow-up project, a Norwegian Arctic climate impact assessment (NorACIA). Its aim was to assess and analyse climate change and its impacts in the Norwegian part of the Arctic. It ran from 2005 to 2009, and a report (in Norwegian) was published in 2010.